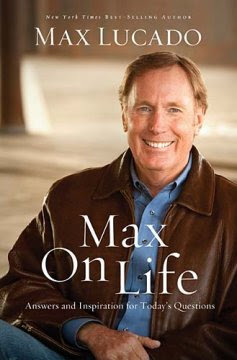 Unlike in previous years where Max Lucado's books are usually topical, this time, Max came up with a compilation of the questions that he had received from years of his ministry and the answers that he gave. Typical of the Lucado's style, he wrote succinctly, often good at playing with the words. The topics that he covered in this book varies from apologetics to prayers to romance to parenting, etc. He answered most of the questions very well, often offering much hope and encouragement. Above all, he demonstrated God's love in many of the answers he gave. We often say that we understand God's love, but actually we don't really because as Max said, we have never been to heaven. And therefore, we don't really know what it means to give up heaven, even just for one second. Furthermore, we have never been sinless, taking upon our shoulders, the sins of another human being. And finally, as Max said, he might gave himself a bit, for the bad guy, but he will never give up his daughter, even if he knows he will have her back. But God did. The Greek word for worry (merimnao) which stems from the verb merizo (divide) and nous (mind). Worry saps our energy and blur our focus. Max dispels the myth that death is always a bad omen. In actuality, death liberates the cocooned soul. Not only death is inevitable, death is necessary for us to enjoy the new life in Christ. As long as see death as a failure, we will perceive God as being deaf to our prayers. When we die, we say bye-bye to what we buy. We are not our credit-card statement. Neither are we defined by the cars we drive. Our purchases may explain us, but they don't define us. Our hearts are who we are. If you define yourself by your stuff, you'll feel happy for a moment when you have a lot and bad when you don't. There are many more gems I gathered from this book. But these are the five most important issues I learned from this book.